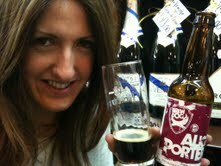 Deveneys of Dundrum: Alice Porter - Brewdog Seasonal. Alice Porter - Brewdog Seasonal. The most popular beer question of all time; porter Vs. Stout... What exactly sets them apart?. Porter still remains the one style of beer that; when researched; all dates and origins differ. Is it Irish; British or German? ; Was the style created pre 1700's or somewhere between 1735 and 1739. I can't answer any of them with confidence. Most accounts of British Brewing in the 1700's say that Porter was a ready made blend of 3 different styles previously available - ''ale''; ''beer'' and ''twopenny'' and because it was a combination of all 3; it was known as ''entire'' (I love this)... When doing my research; it became evident that the style 'Porter' evolved due to economic circumstances and not as a result of the romantic elusive myths... I'm going to ignore that though and continue with conjured thought of cobble stoned Dickens streets; shoves of mist and secret beer recipes brewed under cloak. Alice Porter; named after 'Alice' the Lewis character; is a traditional Porter with the Brewdog twist. It's a 6.2% dark porter. The nose is complex and really unusual. I get medicinal elements; like a tonic with eucalyptus; orange and malt. The palate displays malt; coffee and quinine with a really nice balanced sweetness to counteract the oiliness and acidity of the quinine flavours. It's a tough one to match with food because although the flavours I'm describing are quite brash; it has this elegant lightness. I reckon this is a beer for game meat. If you're out hunting pheasants in your tweed over the weekend; stop by for a couple of bottles... Far more economical that a 1st growth Bordeaux. Another great Brewdog varietal to add to your list. Labels: Alice Porter - Brewdog seasonal. The three-threads/entire story is a pervasive myth about porter. Zythophile writes about it here. As to the difference between porter and stout, today there's none, really. Zythophile again. Alice Porter is lovely, though. Hope things are good over there with you... Long time no see. R.